Pilgrimage is an interesting word. Defined loosely as a journey to a place of significance, the word is also largely associated with the pursuit of a belief or the fulfillment of faith. But what does it mean in the context of the South, particularly in the well-known context of a pilgrimage to a large mansion? Each journey truly lies in the heart of the pilgrim, and as a tourist, in personal preferences. The national conversation has shifted, and with it, how we understand the settings for these Mississippi places and from where the stories grew. For years, the large residences remained the primary narrative and focus. Today’s pilgrimages give insight not only into the grandeur and romance of the Old South, but now include tours of slave dwellings and stories of the people who built, ran and worked the properties. What begins in one place ends in another. “In Natchez, pilgrimages actually began in gardens around large, stately homes. Garden clubs invited ladies to see gardens, but in the case of inclement weather, invited the ladies inside for tea and cookies,” says Sarah Smith-Jones, senior customer service representative for Natchez Pilgrimage Tours. Over time, a small fee was charged to help fix homes. The idea of visiting a prominent place grew to include a collection of homes where the owners agreed to open for the public. Today, many questions have expanded the narrative to include a complete picture of how these historic properties came into being. Walking through a big house means thinking about all the lives and hands that went into building the homes, businesses, plantations and farms. “The story belongs to everyone,” says Jeremy Houston of Natchez who founded Miss Lou Heritage Group & Tours in 2016 with his partner Bryan McKnight. The two Natchez natives offer tourists the opportunity to tour key African-American historical sites like The Watkins Street Cemetery and The Forks of the Road Slave Market. “We tell the story from a slave’s point of view,” says McKnight. “The Forks of the Road Slave Market sold thousands of slaves. It’s one of the most sacred places to visit during a pilgrimage,” says Houston. Three large homes, D’Evereux, Linden, and Monmouth sit within sight of the former slave market, which is near D’Evereux Drive and St. Catherine Street at the Liberty Road intersection. 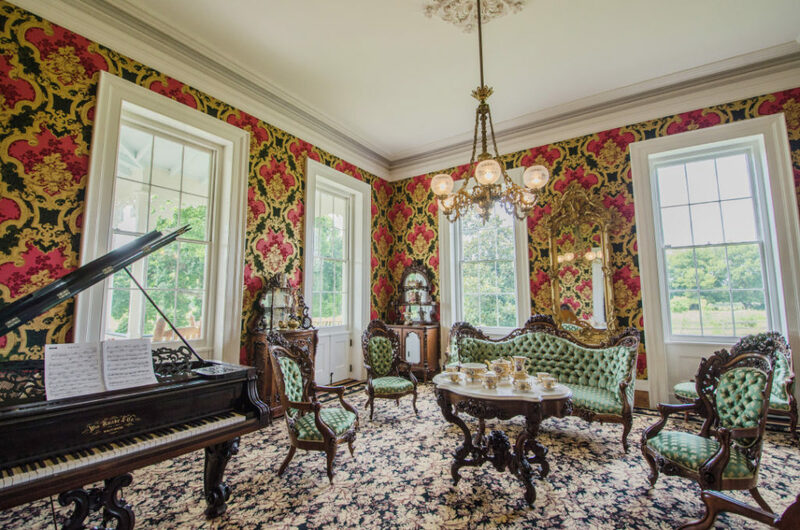 Over in Holly Springs, the organization Preserve Marshall County & Holly Springs has led historical conversations by founding the “Behind the Big House” program, which highlights the surviving structures and stories associated with the grand homes. Founded in 2012, the initiative has grown to include site excavations, authors, preservationists and restorations. In Aberdeen, Gail Dalrymple, vice president and head of the pilgrimage for the last five years, says it’s not clear how the pilgrimage began more than 44 years ago. This year, the tour highlights several smaller residences never before seen. In addition to the 10 properties showcased, Aberdeen also hosts tours of the Old Aberdeen Cemetery where high school students perform “Lies and Legends” a competitive performance to win a scholarship funded by the pilgrimage. More than just a string of open residences, Mississippi’s pilgrimages offer towns an opportunity to showcase their local assets like churches, storefronts, cemeteries and landmarks. Festivals, music, storytelling, reenactments, contests, food and period costumes appear in some degree as part of each pilgrimage. Most pilgrimages also highlight endangered properties and hold fundraisers to raise awareness and money to prevent losing more historic gems. What is the journey? It’s as individualized as each visitor’s curiosity. Maybe it’s to learn more about architecture, gardens or African-American history. Maybe it’s simply to take a carriage ride or visit one of Mississippi’s small towns. In the end, the pilgrimages open doors to more than homes. They open doors to knowledge about our past, our culture and our hopes for the future. To tailor your own pilgrimage, explore more about each event and its personal offerings on the event websites. Most all of the pilgrimages can be found on Facebook as well. The mother of all pilgrimages, the Natchez Pilgrimages happen both in the spring and the fall. Ranked as one of America’s most noted historic towns for Southern architecture and history, Natchez still hosts Mississippi’s most noted pilgrimage with more than 600 historical properties. Both spring and fall pilgrimages have multiple tour tracks, highlighting many elements from decorative arts to movies and private collections. Deemed one of the “Top 100 Events in North America” in 2016, this pilgrimage covers a string of coastal towns, gardens and homes. The pilgrimage was forced to take a break after Hurricane Katrina in 2005 but resumed in 2011. Organized by the Council of Garden Clubs, the event is stronger than ever. Known for early Victorian architecture, Aberdeen’s large lovely homes grew from the abundance of cotton wealth accumulated in the 1800s. Set along the Tennessee-Tombigbee River Waterway, Aberdeen also offers visitors the chance to roam through historic churches, cemeteries and store fronts. Sponsored by the Holly Springs Garden Club, this pilgrimage’s proceeds will benefit the historic property Montrose as it has since 1940. This group serves up gracious dining as well as tours. The Plant-it-Pink luncheon benefits both Montrose and the fight against breast cancer. Steeped in aged beauties, Holly Springs is also home to the Ida B. Wells-Barnett museum.